Well we did it!! We made it to Friday. This week, seemed like such a long week, I never thought Friday would get here. So how was your week? On a positive note, I got my Amercian Red Cross Donation Card, I found out I’m A Positive! Is that a good grade? lol I’m kidding! Funny, at my age I didn’t know my blood type. I know that’s kind of sad! Well, on another topic, I have to say Thursday was quite a day, we had a 3.6 Earthquake in the morning and my friend, Nicole, text me first thing this morning to tell me. Whenever there’s an earthquake people from all over must tell me. Probably because I always say, I know it’s coming and then my friend Andrea and I start looking up what to do and then we predict what would happen if one happened. Were kind of crazy about it! It seems California has been rockin and rolling the past couple of weeks. I hope that the little earthquakes is all were going to have. They say the little ones is good, it’s when we don’t have any and then a big one hits from all the pressure! Eck!!! I only felt a few earthquakes living here and it’s scary and kind of cool in a weird way, as long as there is no damage! 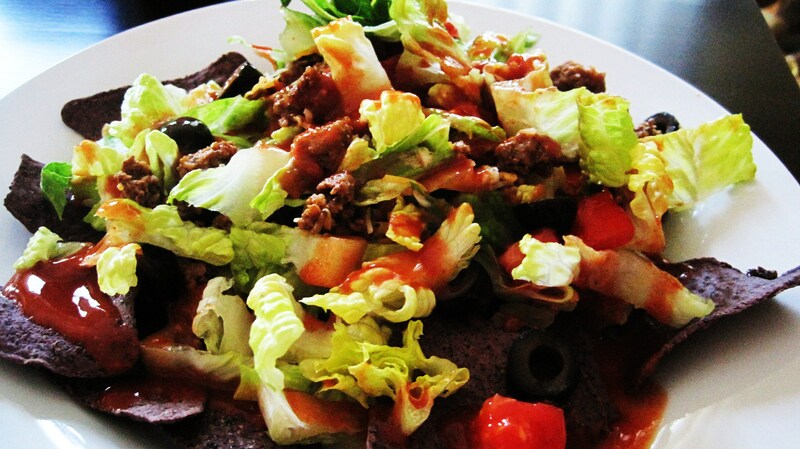 Speaking of Rockin and Rolling I made a Taco Salad that Rocks! It’s healthy and best of all quick!!! First I cooked the ground beef and then I start to layer. First layer, 1/2 cup of Mexican Lite Cheese!! Then 1 Cup of your favorite Salsa! I used Trader Joe’s Chunky Salsa. 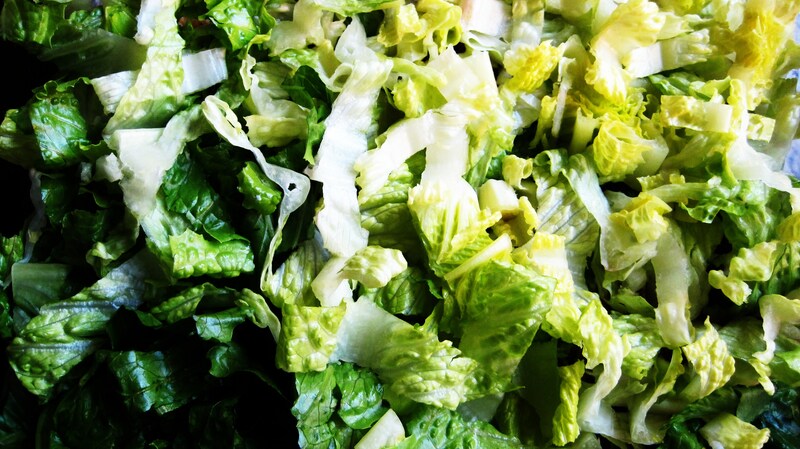 4 Cups of Shredded Romaine Lettuce. 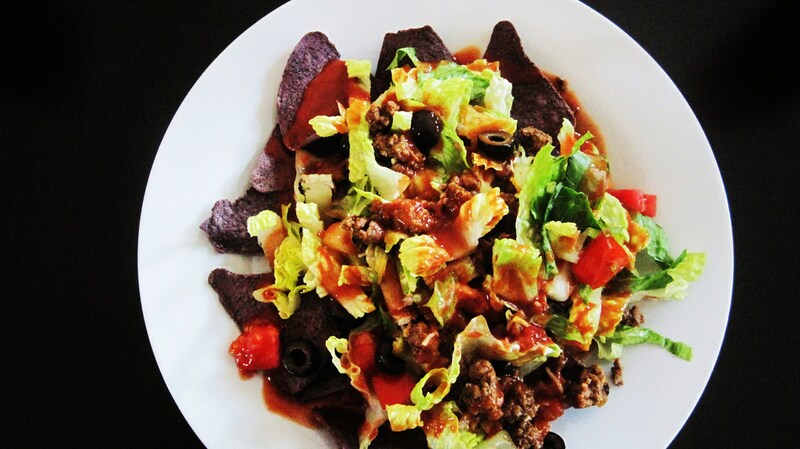 Serve on Tortilla Chips and Load with Hot Sauce! 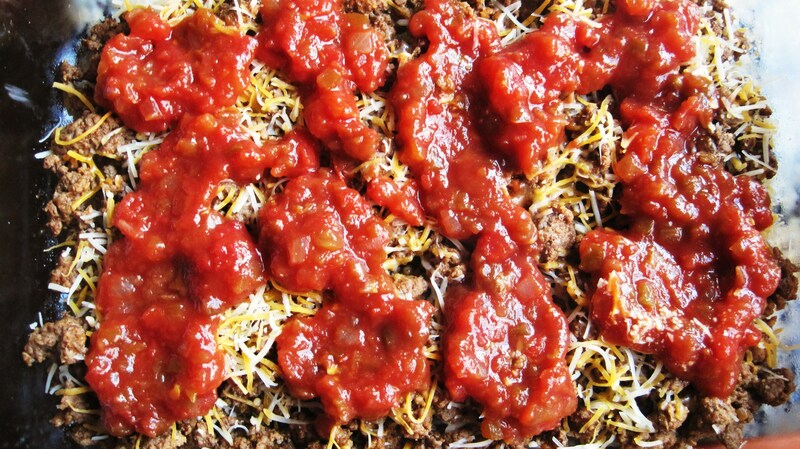 In a pan/skillet, fry up your ground beef, until no pink remains and is fully cooked, about 10 minutes. Add your taco seasoning and water. Cook until water is evaporated. Time to layer! 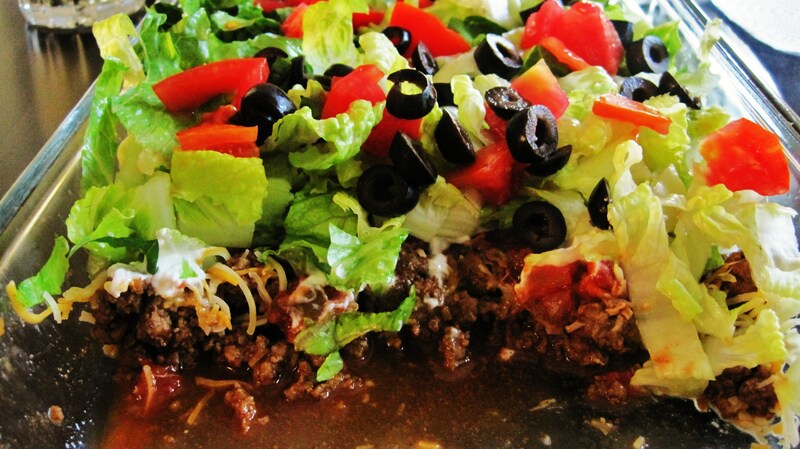 In a Pyrex dish or any big dish you like, add your cooked Ground Beef, Cheese, Yogurt, Lettuce, Black Olives and Tomato. 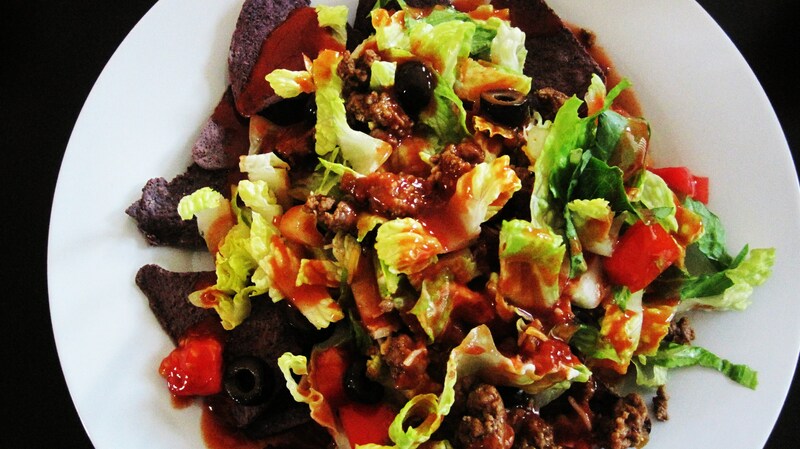 On your dinner plate, add your tortilla chips, top with salad and add your hot sauce. I didn’t add hot sauce or any kind of heat to the salad, I like to let people add there own hot sauce! But for me, I like it spicy!!! 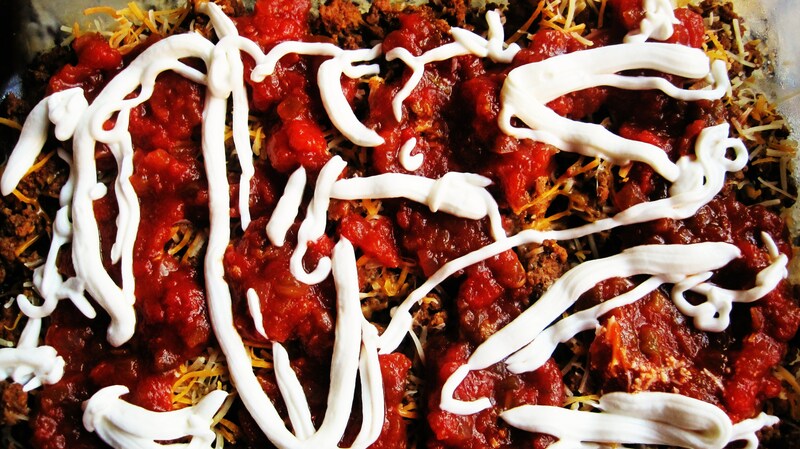 You could add chili peppers to the ground beef or jalapenos to the salad. You can add nacho cheese or anything you like!!! 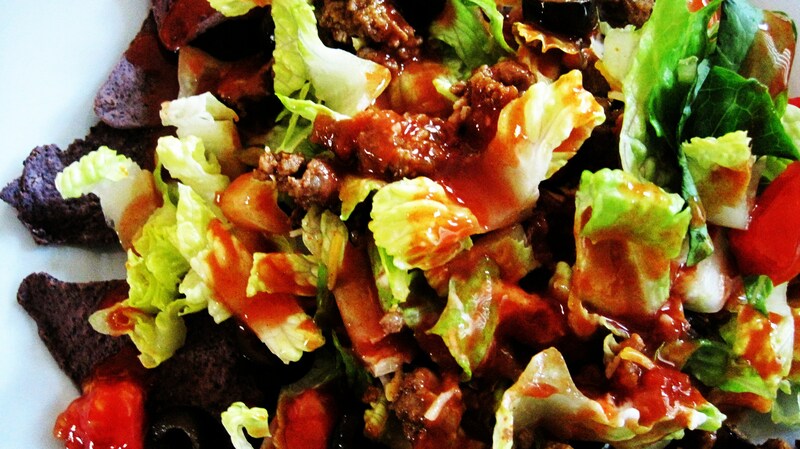 How do you like your Taco Salad? I also like it with shredded chicken, but my family likes beef better!!! 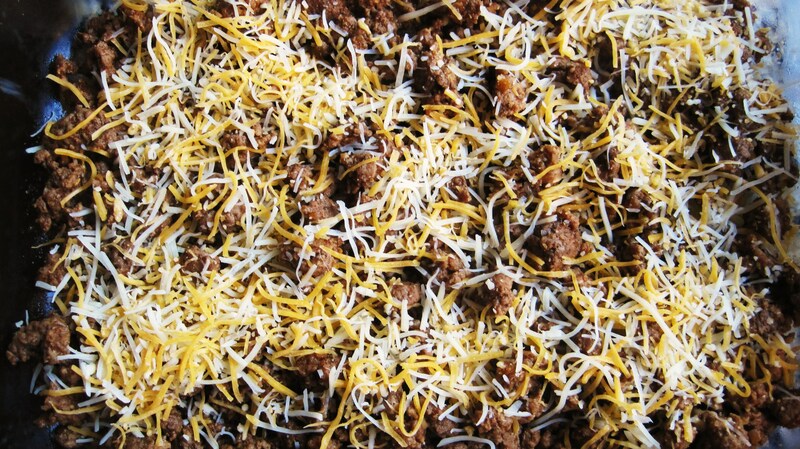 This would be great to make a huge batch and serve it at a football party! Have a big bowl of tortilla chips and a side of hot sauce! Ah, yes, Friday. The day we all anxiously wait for starting at 7pm Sunday night! 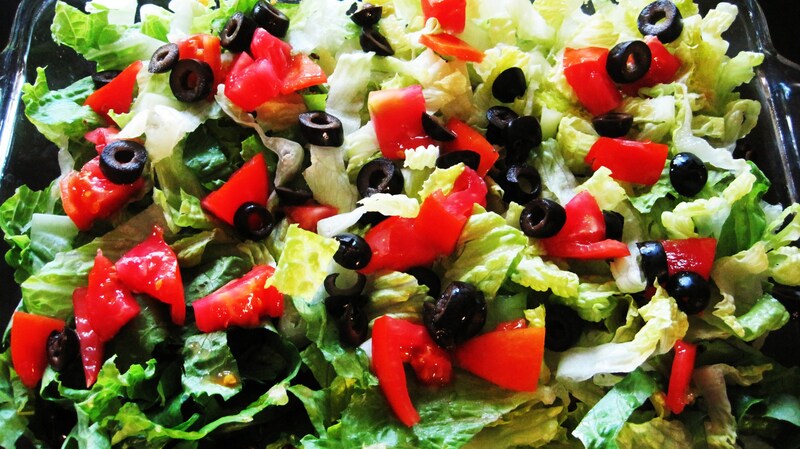 I love Taco salads and using greek yogurt instead of sour cream! I know I love Greek Yogurt! I remember telling my friends to use it instead of sour cream,they thought I was nuts,but guess what, they all use it now! So much better then Sour Cream!! I know I am looking forward to Friday al ready, I guess because Saturday is half over!!! Have a great rest of the weekend!! OMG..just found your blog.. I love it….Thank you for listing nutritional information! Your welcome! I’m glad you found me!! I like adding the nutritional information, I think it’s really important to know, before we indulge in our favorite treats and meals. Welcome and I hope you come back for another visit!! !